Beautiful, deep pink colour on black warp. 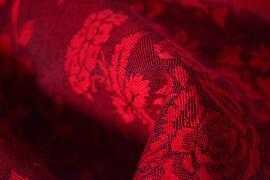 This realese of SKARPUR has a composition of 48% fluffy cotton, 26% Japanese tsumugi silk and 26% tussah. This blend makes the wrap is unbelievably tacky, soft and delicate at the same time. The pattern Grapes required a color combination including bordeaux. And there it is – Grapes Blind Tasting, a union of black representing a blindfold and bordeaux responsible for red wines. A bordeaux yarn carries out its mission with a bang. The Grapes Blind Tasting wrap appears as high contrasted or low contrasted and bordeaux yarn travels over colors of several red wines, from purple to true bordeaux with ruby shades – depending on light. Model used sz. 7 (short) in FWCC and FWCC Tied under Bum. Let’s add a bright yellow for festivity! Grapes Bubbles were inspired by champagne bottles. Many of them are in black and gold, understated and festive. Champagne is a New Year’s Eve drink in many countries. Here in Russia we also make a wish and drink champagne at 00:00. 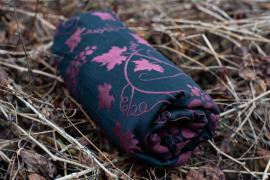 Grapes Bubbles wrap needs some breaking in but is soft and comfortable from the very start. It is suitable for small babies and for toddlers as well. Let it be a lucky charm fulfilling wishes of you and your little ones. Models used sz. 7 (short) in FWCC. It is the first time, when you can find in Shevron pattern blend with 25% tussah silk. SHEVRON SACK is ready to wear straight from the box. Fiorella Red Lips - intensive red color with subtle black flowers. Forma is a very simple, minimalistic and so modern pattern. 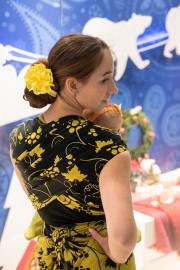 It is a third time, when you can find in Kenhuru wrap blend with 50% tsumugi silk. Beautiful confetti on silk connected with high quality combed cotton creates this gorgeous wrap. 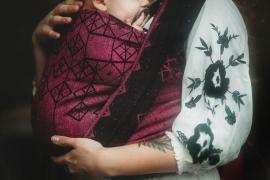 Tsumugi silk makes this wrap very supportive, fluffy and soft from first touch. FORMA SMOG is ready to wear straight from the box. 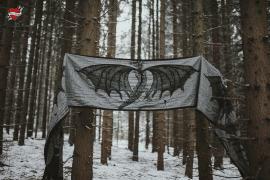 Dreamy Slings Mistery Swan – Black Dawn is a wrap woven out of the finest quality yarn with Oeko Tex Standard 100 ®. 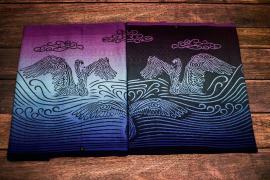 Our wrap has a motif of beautiful swans. These birds are special symbol for us. We fully identify ourselves with their extraordinary sensitivity and emotionality. Swansare representing closeness and everlasting bond because they pair up with each other for life. They are also known as a symbol of fidelity of married couple. They spend together each and every moment trying to keep their partner at least in sight. 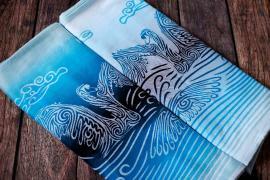 Since they are beautiful, soft, strong and brave at the same time they’ve become our inspiration in creating our first pattern on which they float on the stormy sea. 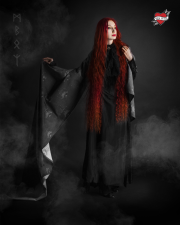 Mistery Swan – Black Dawn represents beauty and gentleness, yet solidity and strength gathered together in one wrap woven out of 100% combed cotton. Four stages of finishing gave them unmatched softness and made them "Ready to Wear", which means that they are ready for use right after getting out of the box. Mistery Swan – Black Dawn wraps, thanks to their softness and plasticity, are perfect for wrapping up a newborn, and also thanks to their outstanding carrying capacity, they will carry toddlers as well. Wraps are unique – there are only 5 available! Three of size 4, one of size 5 and one ring sling (1,95 m on longer edge). 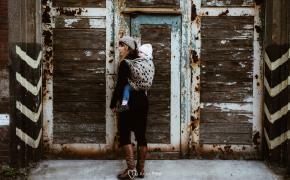 Dreamy Slings Wishspace –Dusk is a wrap woven out of the finest quality yarn with Oeko Tex Standard 100 ®. 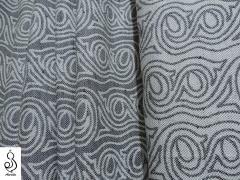 Wishspace –Dusk is a 100% of beauty and softness and 100% of solidity and strength woven out of 100% combed cotton. Wishspace – Dusk, thanks to their softness and plasticity, are perfect for wrapping up a newborn, and also thanks to their outstanding carrying capacity, they will carry toddlers as well. This is the one and only chance to purchase this model. 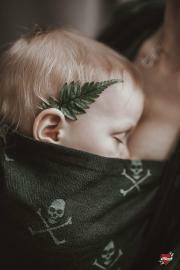 Wraps are unique – there are only 4 available! One of size 5, two of size 6 and one ring sling (2,10m on longer edge). 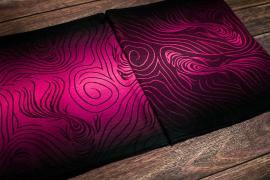 One of Whishspace – Dusk wraps has been already given (before this draw) to one mum to thank her for cooperation with us. The wrap is already hugging a happy little girl ;). Ideale per: fascia per tutte le necessità, sottile e flessibile ma anche forte e resistente, risulta morbida per i piccoli ma ottima per sostenere pesi importanti grazie alla grammatura media; l'ortica è una fibra lignea e resistente, ma traspirante e termoregolatrice, quindi utilizzabile in tranquillità anche nei mesi caldi. FOXY is our new pattern. Very simple, minimalistic and so modern. You can feel luxury on shining texture of high quality combed cotton. 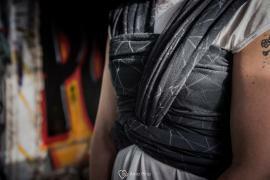 Now dark grey and black are connected and creates this beautiful wrap. Amazingly soft, thin in touch and grippy. FOXY TARis ready to wear straight from the box.